This year one of my main goals is to improve my Japanese. So, less than two weeks into January, I started new Japanese classes! My first private lesson was this evening after work, and I have to admit I was a little nervous. I needn’t have been though – my teacher is lovely, and I really enjoyed it! I’ve booked my lessons through Bristol’s only Japanese school, YU JLS, and have opted for private lessons for now. Today’s lesson was basically just a chat so my teacher could check my level, and she was very complimentary about my speaking ability. I’m not sure if that was just the typical flattery Japanese are so well-known for – 「上手ですね！」(Jyouzu desu ne / You’re so good at that!) – or whether actually I’m not as bad at speaking as I think I am. Either way, I felt quite good about it! I’ve agreed with my teacher that I need to focus on reading, writing, kanji, and grammar, whereas my listening and speaking aren’t too bad. I’m going to be studying for JLPT N3, as I mentioned previously, and also using the textbook Japanese For Busy People II (which I have used a bit of before, but it will be good revision as I’ve forgotten so much). Good luck with your renewed Japanese study this year! 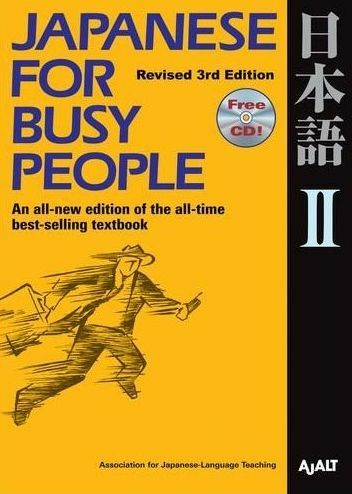 I have used the “Japanese For Busy People” series before and it was really helpful. I’ve never had an opportunity to have a real private lesson or take a class in Japanese, but I’m sure it will help you get more fluent in no time. I’ve been stuck on this level for years. I just haven’t been studying. Think I should. That’s what I figured. I have to do something to get over this plateau. I think my problem is that I have too many things going on. Even though my wife is Japanese, we speak English at home. I will only speak English because I’m the only way my daughter can learn English. She speaks 90% Japanese, which I’d like to change. Good on you! I’m going for N3 this year too. Study study! I had to sit in a 2h lesson to renew my Japanese driver’s license today. The guy was speaking super fast and in the local dialect, but yet I understood everything. I suppose I really should sit down and study, so that I finally can take N1. I took N2 in 2010 and apart from grammar I could have taken N1 back then. Wow – well done! Yeah, sounds like you could definitely take N1! Really? What a coincidence! I hope you do well too!